Works in progress, unfinished and just about to be finished. Last year I worked on the development of a DVD Game title, in a small multimedia studio of around a dozen people. 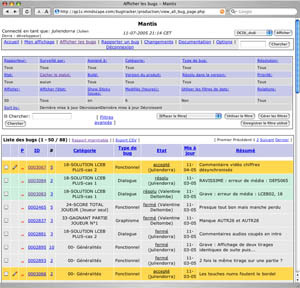 One of the most fascinating tool that we used was a bug tracker. A bug tracking system is a resolution oriented project manager, with a very strong emphasis on ultra-communication through a web and e-mail based interface. Every single problem in the project is supposed to be filed, commented, revised, fixed, then closed. It leads to sometimes endless back and forth message exchanges, vigorous denials, pseudo-retreats, all the bread and butter of a common project with a deadline. As I was totally fascinated by the tool, I discovered that a lot of the others inside the company were slightly avoiding to use the bug tracker, or even clearly refusing to use it. Because it was a tool we used at the client request, some of them saw it like an invasive surveillance of their way of work. Others viewed it as no more than useless additional work. I am not sure that the bug tracking tool produced a better final game. But I found the process was producing an amazing by-product. Permanent exchange, endless argumentation, categorization and recategorization led to a unexpected amount of text. Even better, that text formed a snapshot of the relation between the people exchanging. Albeit a totally distorted one, as each one of the participant would play a role when using the bug tracker, carefully avoiding to report certain feelings about the issues. As an artist, I wanted to do something with that tool : I knew that it produced a amazing vortex of text, reports, categories and links about each issue. Moreover, the process itself was pure ideology of communication made real. I took the naive way, as I often like : if we use a so sophisticated tool for so trivial projects, what a great use of it we could do on a bigger scale. Everybody would like a better life. We had to debug life. It’s a kind of joke, for sure. Because we know that we can’t resolve every problem with a bunch of PHP scripts. The definition of what is dysfunctional in life in general is not even possible : is death a bug ? is sleep a bug ? or features ? But it’s a serious joke, that could teach us what people consider to be a bug in life - their life - and what they would like to see fixed. A tentative database of small and big grief, not unlike the “cahiers de doléances” of the french revolution : debugging life. You are currently browsing the JLNDRR - Atelier weblog archives for December, 2006.